This interactive experiential workshop offers the content and activities from Day 2 of our three-day Improvement Kata/Coaching Kata program with the intent to help you understand and begin practicing a systematic routine for continuously improving the work you do. Developing managers as coaches for creating a culture of continuous improvement, adaption, and innovation. This is done through simple, time-efficient, daily "coaching cycles." Influence how you view your job as a leader and manager. Prepare you to start practicing at home tomorrow – We call it Quick Start! Morning: What are the Improvement Kata & Coaching Kata about? 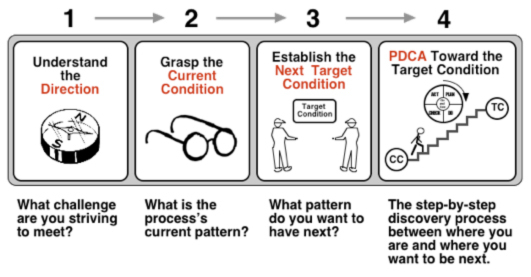 Review the theory behind Toyota Kata (it helps to know what you're trying to do). Afternoon: Improvement Kata Practice with a video example. Senior managers, managers and Lean staff from all industries and businesses that have been implementing lean and/or interested in creating a sustainable culture of continuous improvement through use of the cutting-edge Improvement Kata/Coaching Kata management methodology.